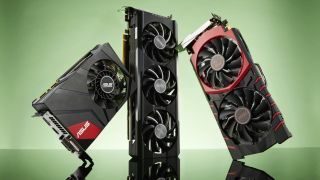 Still, if you’re not willing to pledge loyalty to one of these tech behemoths, it can be hard to decide what the best graphics card for your needs is. Don’t worry though, we here at TechRadar have decided to sit down and figure out once and for all the true winner in the battle of Nvidia vs AMD. (Spoiler: it never ends). These days, the Nvidia vs AMD battle is in an awkward position. Almost two years after the release of the Nvidia GTX 10 series, it released the Turing architecture with the GeForce RTX 2080 Ti, RTX 2080, RTX 2070 and RTX 2060, which is leading the pack in sales. All of these GPUs are much more expensive than their predecessors. However, the GTX 1660 Ti bucks the trend a bit. Hopefully the GTX 1650 is even more accessible. And, while AMD launched Vega back in 2017 and AMD Navi is off in the distance, AMD’s new Radeon VII directly competes with the RTX 2080. But, that doesn’t mean it’s forgotten about the budget market – AMD keeps releasing new Polaris cards, like the Radeon RX 590, aimed at the budget-focused 1080p segment. Right now, the most affordable Nvidia Turing card is the Nvidia GeForce GTX 1660, which starts at $279 (£259, AU$469). Luckily, Nvidia Turing finally got an affordable graphics card. As for AMD, you can find a Radeon RX 500 card for a pittance in comparison. But, AMD is competing with Nvidia again at the high-end with the AMD Radeon VII, which will set you back $699 (£799, AU$1,169), for performance that is almost equivalent to the RTX 2080 in most cases. However, because it’s compatible with Mac – something no Nvidia card can claim – it has a leg up for professionals. When you’re trying to build a PC that’s more powerful than your arch-enemy’s, buying a graphics card isn’t a matter of price but performance. Packing the best performance for the lowest cost is arguably the most pertinent factor in driving GPU sales. AMD has always been known for being the clear value champions, whereas Nvidia usually has more powerful hardware. But, at CES 2019, AMD revealed the Radeon VII. And, now that we’ve got our hands on it for testing, we can say that it’s on equal footing with the RTX 2080 – at least until you turn DirectX 12 on. However, with its 16GB of HBM2 memory, the AMD Radeon VII will shine for any aspiring creatives out there. The lowest end current-generation graphics card in the RTX lineup is the Nvidia GeForce RTX 2060, with performance that outmatches the AMD Vega 56 at the same price point. And, while the prices for these two GPUs are mostly comparable, AMD is currently dominating the budget-to-mid-range product stack with cards like the AMD Radeon RX 580. However, Nvidia just launched the GeForce GTX 1660 Ti, which directly competes with the AMD Radeon RX 580 in both price and performance. In fact, with the Nvidia GeForce GTX 1660, Nvidia is coming for AMD’s mid-range market, providing a GPU that’s more affordable while still being able to handle most AAA games at max settings when playing in 1080p. And, we’ve seen GTX 1650 leaks, along with its retail boxes, which suggests that Nvidia is about to release another budget darling that may put the Radeon RX 570 in its place. And, of course you can’t talk about Nvidia in 2019 without mentioning ray tracing. When Team Green announced its Turing line of graphics card, it made huge claims about revolutionizing gaming with real-time ray traced lighting, shadows and reflections. Games with these features have been out for a while now, and while they certainly look great, these effects drain performance, even from cards designed for them. However, it won’t just be Nvidia for long. Word on the street is that AMD Navi GPUs will have the specs to support ray tracing. Soon, AMD users won’t have to live any more of their lives without ray tracing.